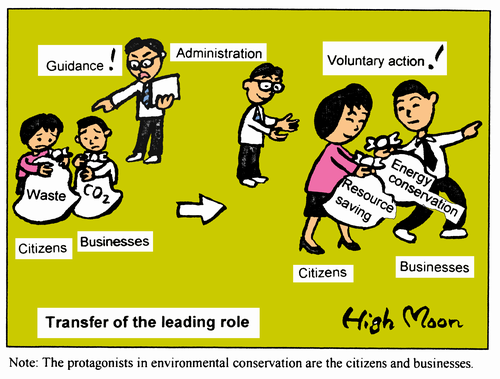 Note: The protagonists in environmental conservation are the citizens and businesses. "This is a very famous object - now, does anyone know the meaning of this character combination?" "Does this life-form lack diversity?" Note: In nature, a creature that lack diversity is said to be unsustainable. Note: Up-cycling is high-value recycling involving excellent design. Winter is a big energy-saving opportunity! Note: More energy is consumed in winter than in summer. Note: Aiming for a sustainable society, this energy is essential. Note: The more you sweat, the more memorable your trip will be. Note: People involved in eco activities will form a natural symbiosis society. Note: We must always keep in mind previous bitter experiences. "If only I could get free of these biggest burdens..."
Note: China and United States are responsible for 40% of all CO2 emissions. Note: This credibility gap is a problem. Let's make February 2R month! Note: Many months are spelt with an R, but only February has two Rs. Note: Recently, swap-meets for bartering of toys have spread nationwide. "It makes no sense to do that survey here!" Japan receives the "Fossil of the Day Award," again! "Well, at your current temperature, those are natural symptoms...."
Note: Rising sea temperatures result in abnormal weather. "Recently, we're always taking turns"
"I will promote employment in my economic growth strategy"
Only companies exhibiting social responsibility will survive from now on. Note: Pollution issues are issues of food safety. Note: Reduction is what we need, not saving. Note: Symbiotic relations with domestic animals are difficult. Note: Let's encourage use of renewable energy by the green energy label. Let's reduce environmental load together, little by little! Note: How will this competition play out? Note: Pre-related waste is increasing in household garbage. "Check the quantity of each one's CO2 emissions!" "Please act with consideration for the whole of society..."
Are these events happening in another world? "Manager! No one is ordering meat dishes"
Let's avoid overconfidence in technical solutions. Note: Worryingly, the interests of industries spoil the global interest. Don't you think that one world last longer? "Pieces keep dropping out and getting lost"
Note: The ecosystem is stable because it contains a variety of species. Note: A huge amount of water is needed for bio-gasoline production. Note: Many kinds of microbes act in decomposition of organic matter. Note: Which of these networks is sustainable?